Hey Buddy, I’m your Body! 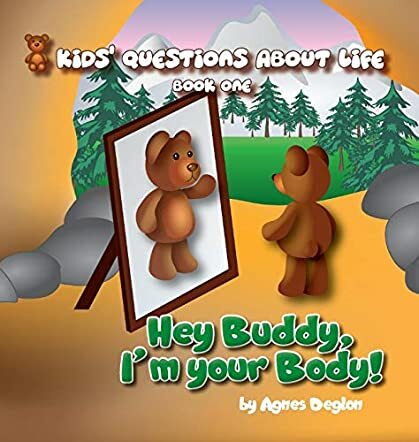 by Agnes Deglon is an educational and insightful book and is the first in the series of Kids' Questions about Life. The book gives readers an introduction about life and how to take care of themselves. The book opens with Tony the bear cub telling readers that everyone is made up of a body, a mind, and a soul. The bear cubs are curious to know how the human body works and they question Mamma Bear and Daddy Bear who explain it to them in an engaging way, making science exciting and interesting to learn. The deeper and more complex issues of the human body are dealt with in an easy and simple manner and this helps children understand how to take care of their bodies. I found the book fascinating and the author’s approach to the subject is novel. The book is filled with facts. The topics covered are the ones that are close to every reader’s heart and will help children connect with their bodies in a better way. The illustrations are wonderful and they make the concepts easy to understand while breathing life into the characters and the scenes. What a wonderful book for tutors, educators, and parents to help children understand scientific facts and give them knowledge about their bodies! The book helps young readers make healthy choices so that they can take care of their bodies and lead a healthy and fulfilling life. I cannot wait to read the next two books in this series on mind and soul. What about you?